I am a registered nutritional therapist having a real passion for foods. I use nutrition to give you the power to change your life for the positive and optimise your health. My practice is also based on functional medicine approach which means that I will typically use functional tests (blood, urine, stool) in order to assess your imbalances that could be at the root of your health issues. I was brought up on the principles of the Weston A. Price Foundation (WAPF) diet: fermented foods, raw milk, organic fruits and vegetables, walking barefoot by the river, foraging, outdoor activities and watching my cousins having their cupping done. I followed some of the cleansing programs and started juicing, inspired by The Gerson Therapy book. I think my interest grew from there. I started working in health food stores – which is how my nutrition and health journey started. I was continuously expanding my knowledge of nutrition, phyto-therapy, different types of foods and sports nutrition. My job became my passion and my lifestyle. I wanted to gain a professional qualification in order to help myself and support others with chronic diseases, having daily contact with customers seeking help for their various ailments and health conditions. Studying nutrition has been life-changing for me. I look back at that time as being crucial in the development of the person that I am today. Who hasn’t heard Hippocrates’ famous quote about letting food be your medicine and your medicine be your food? After making changes to my own diet and lifestyle the difference was incredible. I began exploring fermented foods as a way to address digestive health issues, I switched to a gluten-free diet and reaped the benefits when my coeliac disease and PCOS went into remission. I hold several industry certificates, Nutritional Therapy Diploma from College of Naturopathic Medicine (CNM). 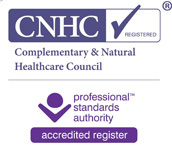 I am a registered member of British Association for Applied Nutrition & Nutritional Therapy (BANT), Complementary & Natural Healthcare Council (CHNC) and Association of Naturopathic Practitioners (ANP). I am a certified ITEC (level 3) Massage Therapist. I offer Swedish massage which can calm your nervous system and promote a sense of relaxation and well being, reducing anxiety and tension in the body that often worsen irritable bowel syndrome (IBS). I am experienced in helping people with gastrointestinal issues – coeliac disease, Inflammatory Bowel Disease (IBD), irritable bowel syndrome (IBS), bloating, regulating bowel movements, acid reflux, hiatus hernia. Thyroid issues – helping reduce hypothyroid symptoms such as weight gain and lack of energy naturally. Food allergies/ intolerances, skin conditions, blood sugar management, and some autoimmune conditions.